The Georgia Economic Development Association held its annual Small Business Rock Star Awards program Monday. Out of 54 nominations, six businesses were recipients of the Small Business Rock Star Award. One of those was the Guardian Centers in Perry. Founder and CEO Geoff Burkart said he is flattered, honored and said it’s better than they deserve. "The Guardian Centers is an advance training and validation center for military and civilian first responders,” said Burkart. "Our business model is structured around advanced curriculums, flexibility and responsiveness to the client. We’ve only been in business for two and a half years, and we are now being recognized in that space domestically and internationally as a destination one-stop shop for training exercises, validation and certification. Burkhart added Georgia is a good place to be in business. He said it is "business friendly because it has an organization called Georgia Economic Development Association. 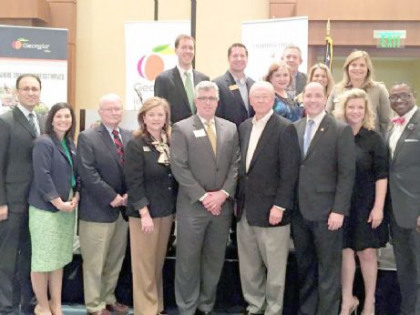 They are a great sounding board to talk about doing business in Georgia. For example, how to get a business started, what are some of the things we would have to look out for, etc. Director of Entrepreneur and Small Business Development Mary Ellen McClanahan said the Georgia Small Business Rock Star Program started in 2013. With this being the second year for the Small Business Rock Star Awards this is the first win for Houston County said McClananhan.